How To Crochet a Skirt of Motifs. There are many ways to crochet a skirt. Crocheting really provides unlimited possibilities for your creativity. The idea of using the crochet motifs for making a garment is not new. Here is my first try. If you think that anyone would fed up with all these numerous squares after the first attempt, I can only say :"Just try..." There are at least three good reasons to do so. It is really easy to do. A crocheted skirt fabric is formed of very simple motifs - pixels. You can use the one which is presented on this page or create your own. If you are knitting/crocheting for years like me, you have tons of yarn leftovers which you have no idea what to do with. This is your chance to get rid of them and, at the same time, to crochet a skirt that you will treasure for years. There is no limit for color combination - 2,4,5..100 colors. Doesn't matter. It is simple , but universal technique. You can design your patterns one of the ways you see on this page where the sides of squared pixels are oriented vertically and horizontally. Turn motif 45 degrees and make its diagonals vertical/horizontal - one more way to create a pixel pattern. In order to crochet a skirt of motifs, lets get the idea how to create a crochet fabric of motifs. Follow the steps. Step 1. Crochet a pixel motif. Crochet a squared pixel and measure it. It will be your gauge swatch. 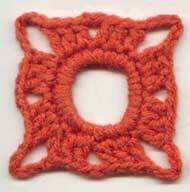 There are only two rounds to crochet to make a pixel (See the picture). To Begin: Chain 14, slip stitch in first chain, to join into a ring. 1st round: Chain 1, 24 single crochets into ring. Slip stitch in the first single crochet, to join. 2nd round: Chain 3 (considered as 1 double crochet), 2 double crochets, (chain 2, 3 double crochets, chain 5, 3 double crochets,) repeat 3 times. Chain 2, 3 double crochets, chain 5, slip stitch to join. Join pixels together in a chosen way. Each pixel has 8 points to be connected to the neighboring pixels: 4 corners (insert hook from top into the 3rd of 5 corner chains) and the midpoints of each side (insert the hook under the chain of 2). Now lets decide how we are going to assemble a skirt of motifs. You have not only to create a crochet fabric, but your fabric has to be shaped proper, to become a skirt. 1.For the beginning we will have to make a skirt pattern (or a small sketch) for the straight skirt, based on your measurements. 2.Design your pattern or at least the way you are going to place your pixels. Calculate how many pixels you will need to cover the first row at the hem line. 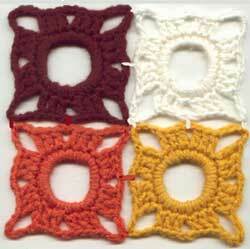 3.To shape your crocheted skirt at the waist line, you have a few choices. a) To use a smaller size hook for crocheting the smaller pixels at the level where the darts are located. This way you will have a skirt which fits pretty tight. Most likely you will need a zipper. b) To use the same size hook for crocheting pixels. It will make the same width at the waist and hip lines. To make the skirt fits your waist, crochet a waistband with the button holes in it for a tie. Similar to the one on the left picture . A rubber waistband can also help to solve the problem. 4. If you are going to use pixel pattern from this page , you will need lining for your skirt or under-skirt to reduce show-through. On the other side, a beach variant of the crochet skirt is more casual. It might need one or two side slits instead. To crochet a skirt using pixels, allows you to create a new fabric the way you want. It doesn't require either some special skills or complex technique. Just relax and have fun. You will be awarded with one-of-a-kind masterpiece.